Fully hand-shaped Epoxy board with 4 channels to maintain speed to grovel through those upcoming summer waves. The Little Chimp!! The Little Chimp Model is a smaller and squashed version of The Chimp…and is designed for smaller grovelling waves and to maintain peak performance. ‘Minion’ Model*. Its a small, fast & responsive shape. 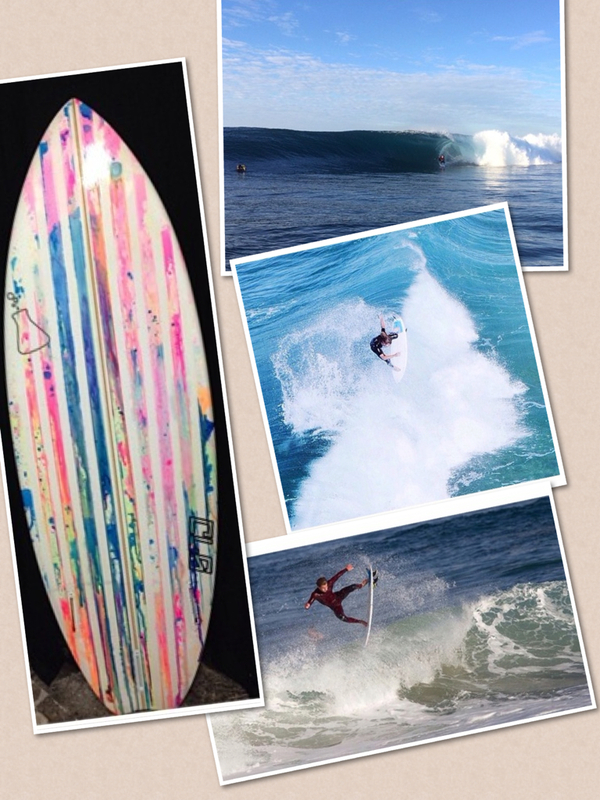 Here’s teamrider Kurt surfing his version of it and loving it! Shaper, Cheyne, testing the Boom Box Model…Welcome back to the 80’s. The decade of legendary songs, spandex & fluro. Whether rocking a Mohawk, mullet or perm hair-do, listening to Sweet Child of Mine by Guns 💪 n Roses 🌹or Kokomo by The Beach Boys, no surfer will forget the birth of the Thruster with thanks to Simon Anderson. Being born in the 80’s, Cheyne decided to bring back 80’s style thruster that he would buy from Cash Converters back in the 90’s but added with it now a twist of modern concepts based on his own design style. Always racking his brain for new creativity, he felt the need for a freshened version based on the 80’s thruster. Not having to go and get a Mal or a fish or an alternative that’s completely different but being able to still use the high performance shortboard concept to have a beefier board to catch waves on with volume and paddle power. Thrown in to the mix, Cheyne added to this new model the belly channels for authenticity. He has tweaked and refined the shape to give it that modern high performance shortboard edge. This new model Incorporates the elements of the modern 3 fin and older style outlines. Can’t thank you enough.. Looking forward to doing business with you guys in the future..